The computer accessory market leader, Genius, has introduced its latest innovative so called“buttonless” mouse lately. This unique and innovative product, Traveller 525 Laser, does not have any visible buttons or scroll wheel which the conventional mouse used to has. 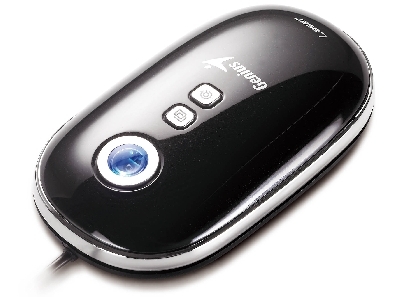 In stead of clicking the traditional mouse buttons, Genius Traveller 525 Laser, adapted the unique “float to click” design idea which allows users to lightly tip the casing for executing the commands. It gives users a more relaxing mouse click feeling and reduces the tension on their fingers. The traditional scroll wheel has also been replaced with an OptoWheel. OptoWheel features an optical sensor on the mouse’s top which registers the user’s finger movements. Traveller 525 Laser has also taken into consideration on those users who are unable to give up the clicking sensation completely. Two custom buttons have been inserted in the middle of the casing to assist this group of people.